Good morning and happy start of a new week, you guys! I woke up feeling so positive this morning because we had a productive weekend and the weather is finally improving this week. Tuesday and Wednesday are supposed to be in the 70s! Today I’m sharing my travel outfit that I wore home from Tulum. These high-waisted joggers are the perfect pants to travel in because they’re SO comfortable, but fashionable at the same time. I can’t stand wearing an uncomfortable outfit when I travel, so you’ll usually find me in joggers and tennis shoes. 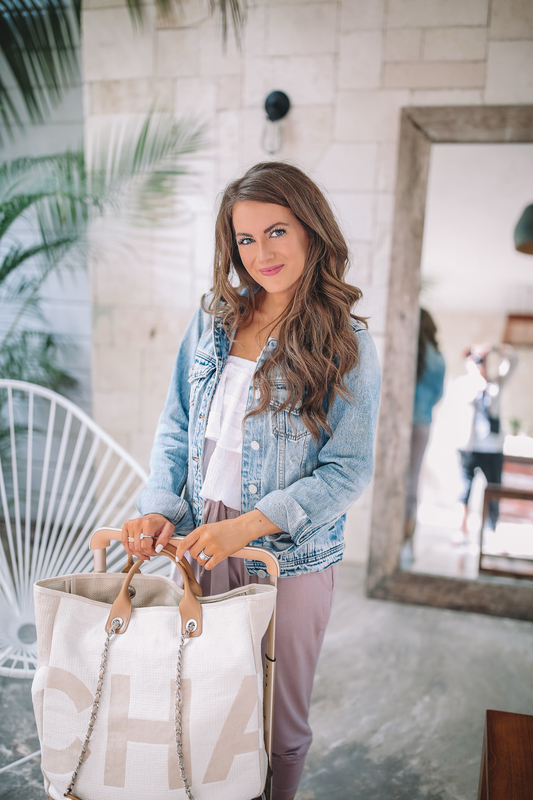 This jean jacket goes with pretty much every outfit and is nice to have on the plane since it can get chilly! 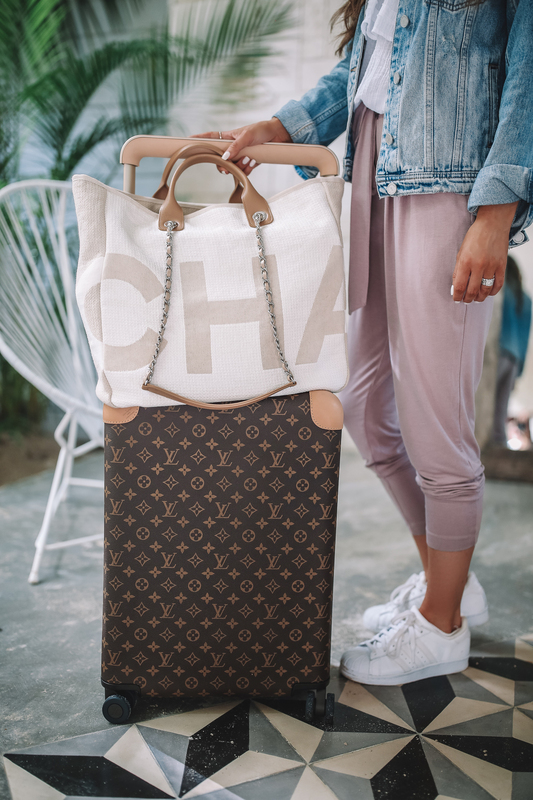 In addition to my travel outfit, I wanted to share some of my top travel necessities. So far in 2019 I’ve been to Hawaii, England and Mexico and I brought all of these with me on each trip! I first heard about the Trtl pillow from my friend Gracie, and when I saw her using it in the airport I got my computer out and placed an order right then and there! This neck pillow takes up virtually zero space in your bag (unlike the traditional travel pillows which can be bulky) AND it’s so so so comfortable. It’s made of soft fleece and wraps around your neck securely to hold your head in an ergonomic position on the plane. I also really like that it’s machine-washable! I own this silk sleep mask in the light pink color – I’ve definitely gotten my money’s worth from it because I use it all the time, both at home and while I’m traveling. It’s made of silk, which is really important – the silk fibers are extra gentle on your eyes and eyelashes. And don’t worry – you will never wake up with creases from this sleep mask. There are a few apps that I really love for traveling. The first app – TripIt – has completely changed my life and the way I travel (and if you travel a lot, you need it too!). TripIt organizes all your travel plans into one place, with all the info you need such as dates, times, confirmation numbers, flight times, etc. You simply forward your confirmation emails to plans@tripit.com, and the app creates a master itinerary for each of your trips. The thing I really love about this app is that you can access it even when you don’t have internet access (i.e. if you’re on an airplane or in a foreign country!). The app even shows maps of the airports you are flying in and out of, making it incredibly easy to navigate and find your next gate. After using this app, I don’t think I could travel without it. The other app that I really I love is the YouTube app – I looove watching YouTube videos but I always thought you couldn’t watch them on the plane since the internet service is not good enough to stream videos. Well guess what you guys, with the YouTube app you can download videos ahead of time and then watch them whenever you want – even on a plane! If I know I’m going on a trip in a couple of days, I will download a bunch of videos from my favorite YouTubers so that I can watch them on the plane. I alway pack a little bag in my purse with some beauty essentials. I’m obsessed with these eye serum masks for your under-eyes, as well as this jade roller – I don’t even use it with a face cream or serum, I use it by itself. It has a cooling sensation and helps with lymphatic drainage so you don’t walk off the plane with a puffy face. I promise it works! I always pack a nourishing lip balm as well as hand lotion for moisturizing on the plane. This one might sound a little odd but hear me out 🙂 I always pack my own tea bags with me on the plane because they are SOOOO good for de-bloating! When the flight attendants come around and distribute drinks, I always ask for hot water and then just use my own tea bags to make tea. My favorites are peppermint tea, ginger tea and this detox tea – they’re great for digestion and water-retention. I noticed a big difference in my bloating when I started bringing along my own teas on flights. If you have any travel essentials that we need to know about, let me know in the comments! These are really great tips! I have been thinking about a jade roller, so I will be picking this one up if you say it works! You always have great content. Thanks so much! Um okay I didn’t know that about Youtube! Totally downloading videos for my trip this upcoming week! I always love reading travel essential posts because I find them so helpful! I think I need that travel pillow… My next trip is 24 hours to my final destination! I didn’t know that about the Youtube app but i’m glad you shared that because we’re flying in a couple of weeks and I’ll be downloading videos to watch! Thanks! All really great essentials! Need to add those eye masks to my travel essentials! That jogger looks like the most comfortable thing ever! And oo I need to try that neck pillow! Where are your rings on your right hand from?! They are so sparkly! Great tips for traveling! Thank you. I love your travel blogs too! Can you share your favorite youtube accounts? I’d love to know! 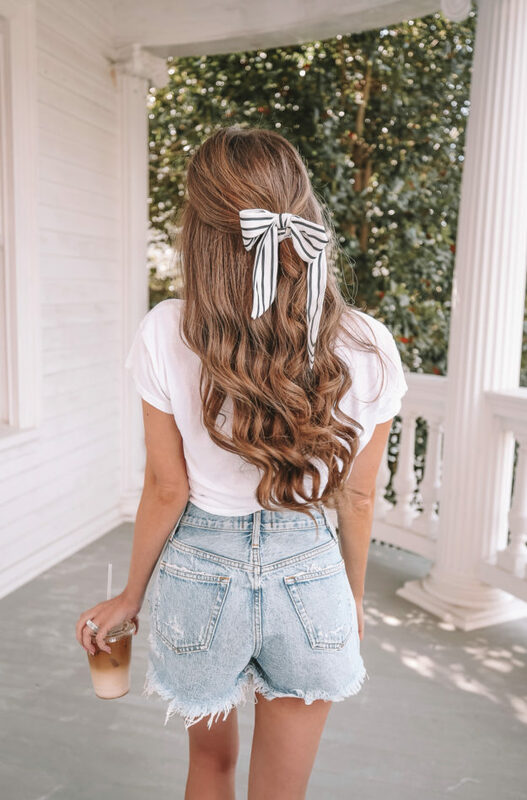 What an uber cute travel outfit! I always feel like I look like I don’t have any clothes in my wardrobe and just threw on whatever when traveling hahah, but I ALWAYS take comfort over style on long flights or train journeys! Time to invest in some cute joggers I guess hahah! Very nice post. Great tip about bringing your own tea bag and I am very intrigued by this neck pillow. It’s only the start of February and you already have been on three trips! How cool is that! But must be stressful as well. Props to you for always delivering top notch content even when on the go so often! Hi Cait, do you have any tips about flying with anxiety? I have extreme anxiety while flying especially on longer flights. 😬 Thanks for your help! Awesome essentials, I always carry tea bags with me too – best way! These are all such great tips! I always pack some snacks for flying – usually that’s an RX bar or something else small in case I get hungry. That way I don’t have to rely on airport food! I do the same thing with Netflix that you do with YouTube! It works so well and I love having the entertainment on the plane or in the airport! How does the LV hold up with travel? I love it but I’d be terrified to check it and it has me looking at the duffle instead. I just downloaded TripIt to organize some upcoming trips and it is seriously amazing. Thank you for the rec! 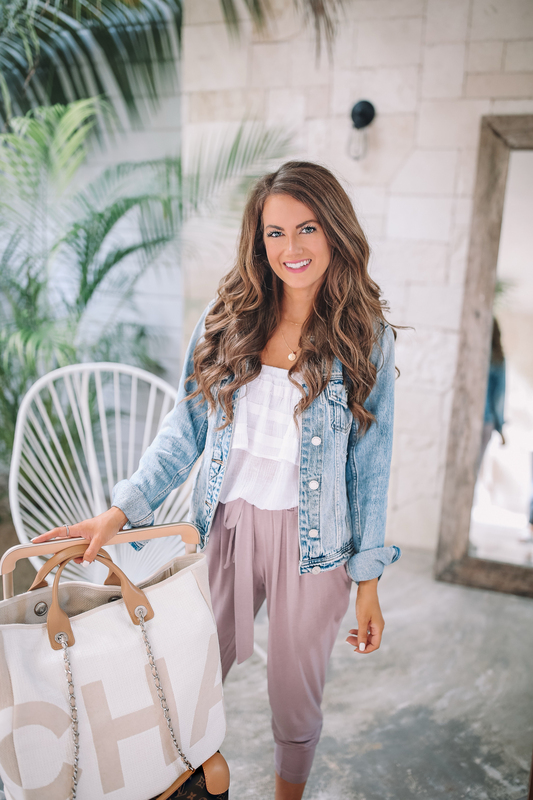 Very helpful Travel Essentials clothing….like jean jacket,Joggers….Very efficient outfit Thanks for sharing! Do you happen to have any posts about short weekend getaways or 4 day trips that are easy?? I am a mom of soon to be 4 and I want to travel more but, I don’t have a whole week to go places and I feel like by the time you fly and get somewhere you’ve wasted a whole day! I’m in Minnesota so I guess in the US/Canada would be the only easy option. Hey Erin, I highly recommend Charleston!! Have you been yet? I have a Travel Guide to Charleston, it’s AMAZING! These are such great tips! I don’t travel very often, so I never think to bring some of this stuff until I need it. By the time I travel again, I can never remember what extras I wanted! I definitely would like to do more travelling though. Your outfit is seriously the cutest and those pants look like heaven! It’s definitely hard to find nice joggers that are cute, comfortable, and stylish! These great travel tips! What YouTubers do like best? I’ve been looking for some good videos to watch! These are great travel tips! What YouTubers do you like best? I have been looking for some good videos to watch!